Grey China - 160 items found. 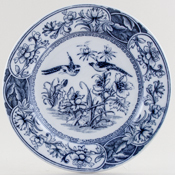 A most unusual dish printed in a smoky grey and as its name suggests printed with a variety of birds. Very attractive shape with moulded side handles and central handle to the cover. Backstamp: Ornithology W Adams & Co England. The base has a little minor wear to the rim otherwise excellent condition. The cover has light all over crazing and a some wear to the handle otherwise fine. Overall a fabulous piece. With gilt. Lovely three part dish, base strainer and cover. Backstamp: Sheraton Adderleys Ltd Rd No 466??. There is a little wear to the gilt on the base. The strainer has a manufacturing fault inside and the glaze is a little patchy to the rim. The cover has a little wear to the gilt on the handle. Overall a very pretty piece. Delightful pot with passion flower pattern printed in a soft grey. Backstamp: Sydenham FM & Co and impressed Ashworth. A little wear to the foot rim, a few minor signs of age and a small hairline to to the top of the handle. James Beech active 1878-1889 Delightful little piece with gently fluted rim and printed with a grey floral design of mainly Lily of the Valley. Backstamp: Grey printed Eva There are some minor manufacturing blemishes. James Beech 1878-1889. Lovely little cup and saucer with a grey floral design of mainly Lily of the Valley. Backstamp: Eva Minor glaze blemishes and saucer has some crazing. Lovely stand in a colour not often seen in Asiatic Pheasants pattern. Backstamp: Asiatic Pheasant B & H. It has a touch of crazing, a little minor surface scratching, a little wear to the outer rim and a few minor blemishes, overall excellent - sounds much worse than it looks! Pretty little vase, probably from a toilet set. Backstamp: Arran Bisto England. Minor signs of wear and print a little patchy otherwise fine. Small platter printed in a steely blue/grey and with embossed detail to the rim. Backstamp: Parisian Granite Mayblossom Pattern Booths England No 3 and impressed Booths. Some surface scratching, a little wear to the rim and a couple of small areas with bubbling of the glaze. 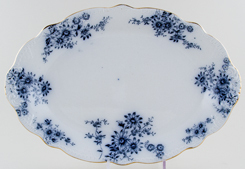 Very attractive dish with ornate handles and decorative moulded detail to the base and rim of the cover. Backstamp: Parisian Granite Mayblossom Pattern Booths England No 3. The base is crazed and the cover is a poor fit. Attractive shape of boat with ornate handle printed in a steely blue/grey. Backstamp: Parisian Granite Mayblossom Pattern TG & FB England. Light all over crazing and a little minor wear under the foot otherwise excellent condition. 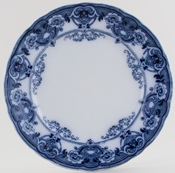 Very pretty plate with embossed decoration to the rim. Backstamp: Parisian Granite Mayblossom Pattern TG & FB England and impressed Booths. A little surface scratching otherwise excellent condition. 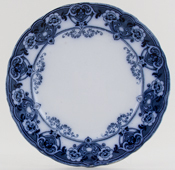 Very pretty plate with embossed decoration to the rim. Backstamp: Parisian Granite Mayblossom Pattern Booths England No 3 and impressed Booths. A little grey spotting here and there otherwise excellent condition. 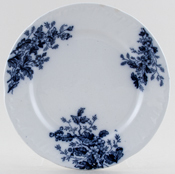 Very pretty plate with embossed decoration to the rim. Backstamp: Parisian Granite Mayblossom Pattern Booths England No 3 and impressed Booths. The occasional very minor blemish overall excellent condition. With gilt. 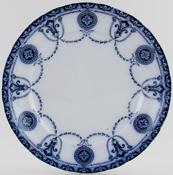 Very attractive dish with embossed detail to the rim. Backstamp: Royal Semi Porcelain Princess May Pattern Booths England Rd No 183173. Light crazing with a little surface scratching. The gilt is very worn and there is the occasional very minor blemish. On the back a little minor wear. Overall a very pretty dish. This platter is printed in grey with one of the scenes from the Bude series. These scenes were possibly inspired by the Crimean War and some appeared also under the Palmyra and Navarro pattern names. This later production with its distinctive lozenge border was named Bude. Backstamp: Impressed Brownfield & Sons and date mark for March 1883. There is a little surface scratching and some wear to the outer rim but overall a lovely little platter. Made by William Brownfield of Cobridge. The design is printed in a slate grey and then hand painted with red, orange and green in a manner that is both stylish and so of its period. Ochre rim. Blue printed garter mark and crown cartouche, which incorporates Kinburn, No. and W B. Impressed diamond registration mark, which usually means that it is the shape that is registered rather than the pattern, for 1 April 1854, patent number 95510. Pattern number in script 8740. Kinburn was introduced about Oct 1855 with that number. The glaze is finely crazed, there is a minor nick to the rim and a rim chip, which is large on the back, but small on the front and inclined to get "lost" in the decoration. Looks great on display. With gilt. Fabulous piece printed in grey with gilt highlights. Backstamp: Burgess & Leigh Middleport Pottery Burslem Burleigh Ware Semi Porcelain England Hamilton Rd No 588775. Excellent condition. With gilt. Fabulous piece printed in grey with gilt highlights. Backstamp: Burgess & Leigh Middleport Pottery Burslem Burleigh Ware Semi Porcelain England Hamilton Rd No 588775. The gilt is a little worn and there is some surface scratching but overall fine, a lovely platter. With gilt. Fabulous piece printed in grey with gilt highlights. Delightful embossed details to the sides and to the central finial on the cover. Backstamp: Burgess & Leigh Middleport Pottery Burslem Burleigh Ware Semi Porcelain England Hamilton Rd No 588775. The base has a touch of crazing and some wear to the gilt, overall excellent condition. With gilt. Fabulous piece complete with stand and ladle printed in grey with gilt highlights. Delightful embossed details to the sides of the stand, tureen, ladle stem and to the central finial on the cover. Backstamp: Burgess & Leigh Middleport Pottery Burslem Burleigh Ware Semi Porcelain England Hamilton Rd No 588775. Stand, tureen and cover have light crazing with a little discolouration to the stand. On the tureen and stand the gilt is quite worn and there are a few minor blemishes to the ladle. Overall a very pretty set. Rhine is an old Samuel Alcock design, inherited by Burgess & Leigh and here printed in a light delicate shade of grey. Printed backstamp of beehive with Hill Pottery and B L & Co for Burgess Leigh & Co. There are minor signs of wear around the rim but the face of the dish is as bright and clean as the day it was made. 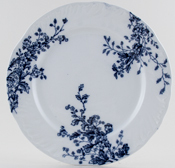 Lovely plate printed in a blue/grey hue. Backstamp; Byzantium BWM & Co Cauldon England and impressed Cauldon. A little minor surface scratching otherwise excellent condition. Delightful little plate. Backstamp: Impressed Cauldon. Some surface scratching otherwise excellent condition. Very attractive pot printed in a pale grey. Pretty printed floral detail to the spout and to the top of the handle and very pretty floral finial to the cover. Crown Ducals version of Asiatic Pheasants. Backstamp Bristol Crown Ducal England Rd No 762055 A touch of minor crazing here and there otherwise excellent condition. Crown Ducals version of Asiatic Pheasants printed in grey. Pretty wavy rim bowl. Crown Ducals version of Asiatic Pheasants printed in grey. Pattern on inside of bowl only. Wavy rim bowl printed in grey with pattern on the inside only. Excellent condition. Lovely double spouted boat on a fixed stand. Backstamp: Bristol English Ironston Crown Ducal A G R Made in England. Decoration hand engraved printed underglaze. Pretty wavy rim saucers. Crown Ducals version of Asiatic Pheasants printed in grey. Cup has crazing to the glaze. Pretty wavy rim saucer. Crown Ducals version of Asiatic Pheasants printed in grey. Pretty wavy rim plate. Crown Ducals version of Asiatic Pheasants printed in grey. Crown Ducals version of Asiatic Pheasants printed in grey. Cup only. Pretty wavy rim bowls. Crown Ducals version of Asiatic Pheasants printed in grey. Very pretty with moulded wavy rim and printed in a light grey. Good as a dessert or small soup plate. Backstamp Bristol Crown Ducal England Rd No 762055 Excellent condition. With gilt. 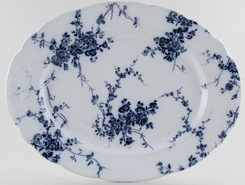 An extremely ornate dish with fabulous detail highlighted with gilt to the handles and feet and the pattern printed in a smokey flow blue. Backstamp: Fan Davenport No and in script 3713. Around the handle join and to the handle there is some brown mottling. The cover has light crazing with just a hint of discolouration and a small hairline to the finial. The cover is not a precise fit. With gilt. 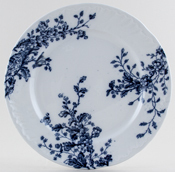 An extremely attractive rimmed soup plate printed in a smokey flow blue/grey. Backstamp: Fan Davenport No, in script 3713 and impressed registrtion diamond for 1879, Davenport above and anchor and date for 1882. A wonderful pattern on this drainer, printed in a slightly flow grey. Backstamp: Printed cartouche backstamp Java Davenport and impressed Davenport above the anchor and date code for February 1880. Light all over crazing with a little wear to the outer rim, otherwise excellent condition. Lovely floral drainer, printed in a light grey, featuring lilies. Backstamp: Lilium Davenport and impressed Davenport, date for 1860 and 16T. Light all over crazing with a little very minor pitting and discolouration around some of the holes, overall excellent condition. With gilt. 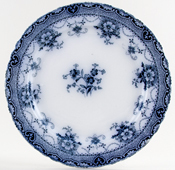 Attractive dish with embossed decoration to the rim and quite deeply canted sides. Backstamp: Australia F & S. A few minor blemishes and on the back a little minor wear, overall excellent condition. With gilt. 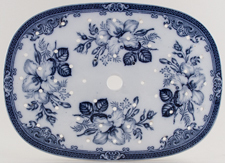 An extremely decorative dish with ornate handles and embossed details to the cover. 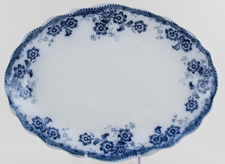 The body of the dish is gently moulded and has embossed scallopped decoration around the lower half. Backstamp: Australia F & S. The dish is crazed and there is a small chip underneath to the foot. The cover has a touch of crazing and two tiny tiny nicks under the rim. With gilt. A lovely oval dish with ornate handles. Backstamp: F & Sons Ltd Belmont Burslem. There is a little wear to the gilt otherwise excellent condition. A most unusual eight sided dish with ornate handles and decorated with lovely floral panels printed in a greeny/grey. Backstamp: F & Sons Ltd Brampton Burslem England. The base is crazed and inside there is the stilt marks are quite deep and pitted and the cover has a little wear to the rim. Very pretty plate. Backstamp: F & Sons Carlton Burslem. A little wear to the outer rim overall excellent condition. An absolutely gorgeous dish printed in a rich smokey grey with ornate handles. Backstamp: F & Sons Chatsworth Burslem. Inside the base there are a few very minor blemishes. To the cover there is a little wear to the finial and underneath a little minor discolouration. Overall excellent condition and a fabulous dish. With gilt. Very attractive dish with ornate handles. Backstamp: F & Sons Ltd Devon Burslem. There is a little wear to the gilt, inside the base a little discolouration to the stilt marks and the handles have a little wear and minor discolouration. Overall a lovely piece. Backstamp: F & Sons Ltd Devon Burslem. Surface scratching. With gilt. Fabulous multi sided dish with ornate handles. Backstamp: F & Sons Dudley Burslem The base has a little wear to the gilt, a little crazing and inside the occasional minor blemish. The cover has a small manufacturing fault on the top otherwise excellent condition. Extremely pretty platter. Backstamp: F & Sons Florida Burslem. A little very minor surface scratching otherwise excellent condition. An extremely pretty dish with loop handles printed in a light grey. Backstamp: F & Sons Ltd Melba Burslem. There is a little wear and discolouration to the rim of the base, not noticeable when the cover is in situ' otherwise excellent condition. With gilt. Lovely jug with gently flared base. Backstamp: F & Sons Ltd Melton Burslem England. Crazed and the gilt is very worn. With gilt. Lovely jug with gently flared base. Backstamp: F & Sons Ltd Melton Burslem England. The gilt is very worn and there is a little discolouration to the rim and handle otherwise excellent condition. With gilt. Fabulous large dish with wavy rim printed in a flow grey. Backstamp: Sylvia F & Sons. With gilt. Fabulous large dish with wavy rim. Backstamp: Sylvia F & Sons. The outer rim is worn with loss of glaze and a little discolouration and there are the occasional very minor blemishes otherwise excellent condition. Extremely pretty plate printed in a subtle grey, with hint of green. Backstamp: F & Sons Trent Burslem. Some surface scratching. With gilt. 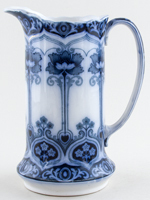 Very attractive jug with wavy rim. Backstamp: F & Sons Ltd Victoria Burslem. The gilt is very worn otherwise excellent condition.